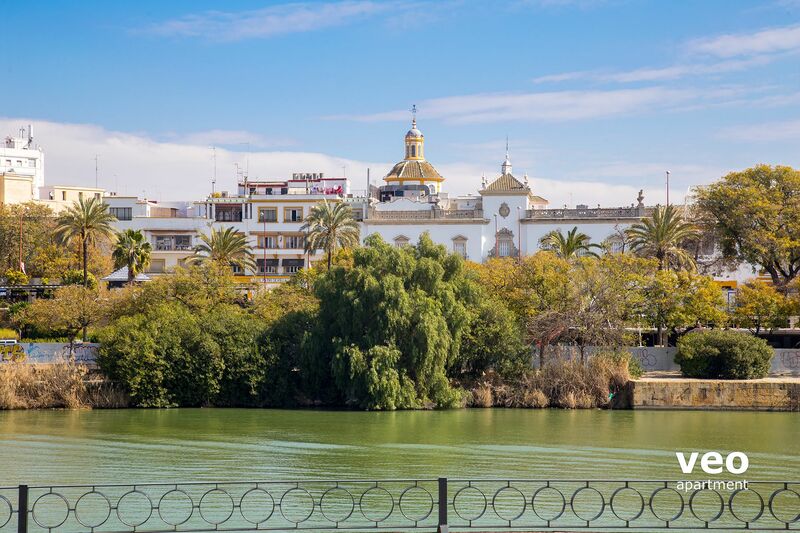 Apartment with 1-bedroom and 2 bathrooms on Betis street, facing the Guadalquivir River. 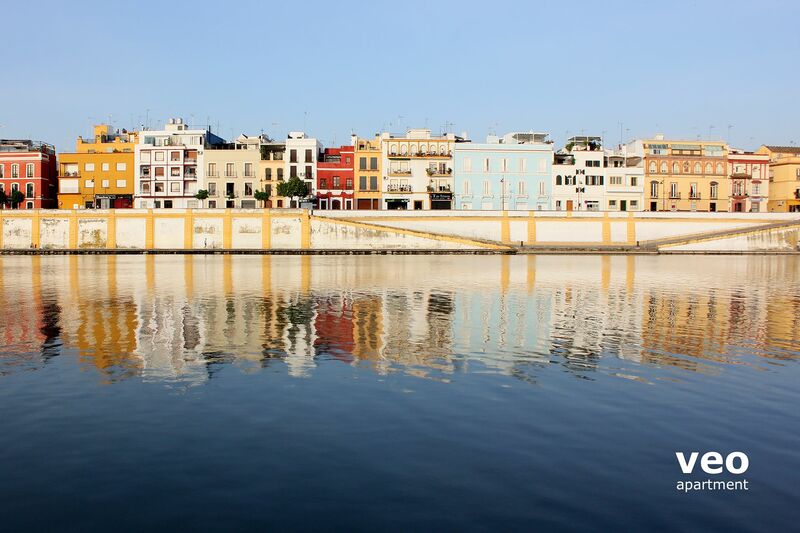 Triana quarter. 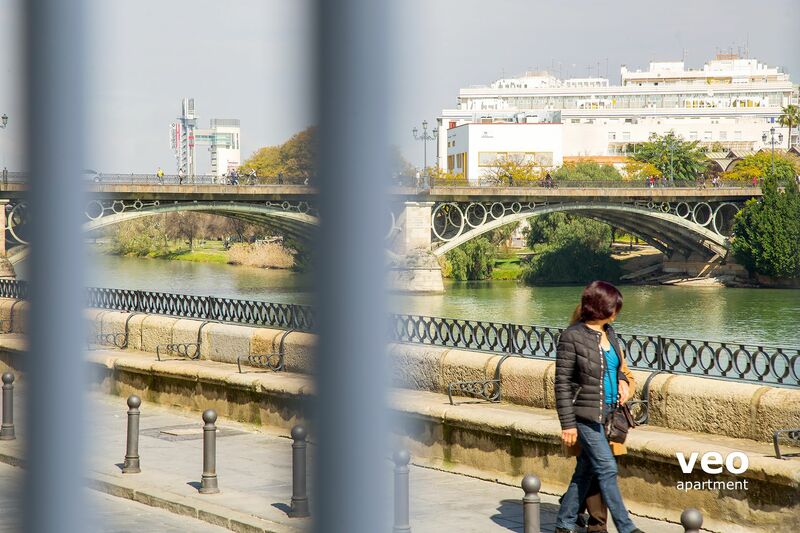 Views from the apartment include some of Seville's most famous landmarks: Triana Bridge, La Maestranza bullfighting arena and La Giralda (Cathedral of Seville). 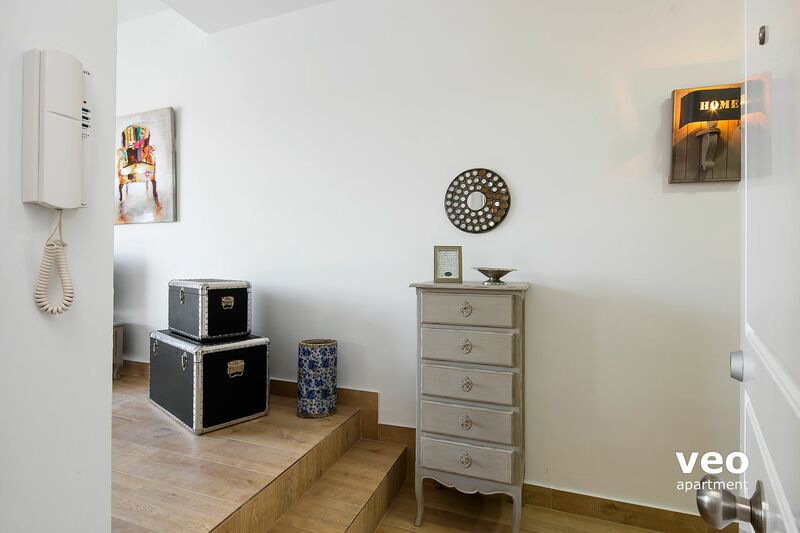 The elegant interiors are decorated in a classic style combined with modern elements. The living-dining room has a large window facing the street, with river views. There is a sofa, coffee table and TV. Dining table and chairs. 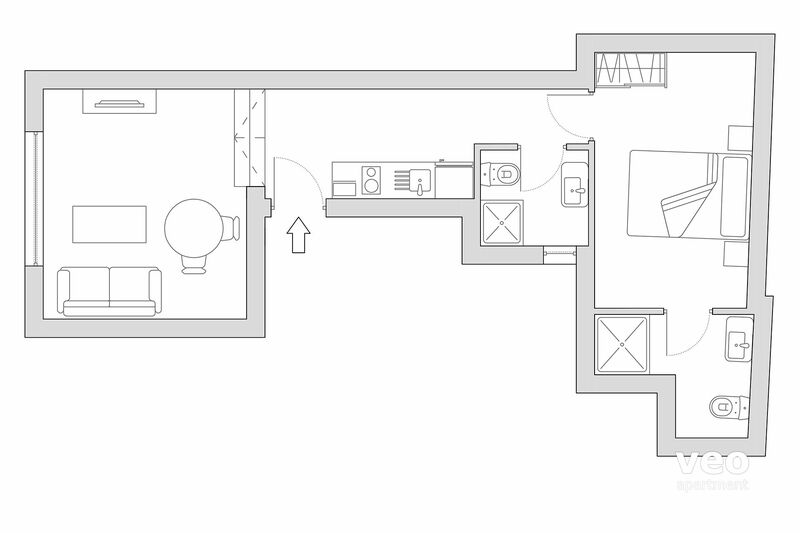 The open-plan kitchen forms part of the passageway between the living-dining area and bedroom. 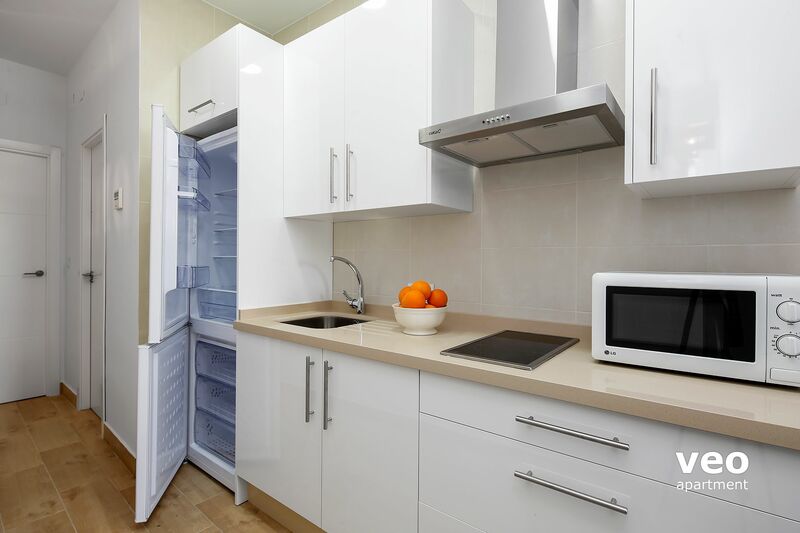 Kitchen fully equipped with all main utensils and appliances for self-catering, including: fridge/freezer, microwave and stove. 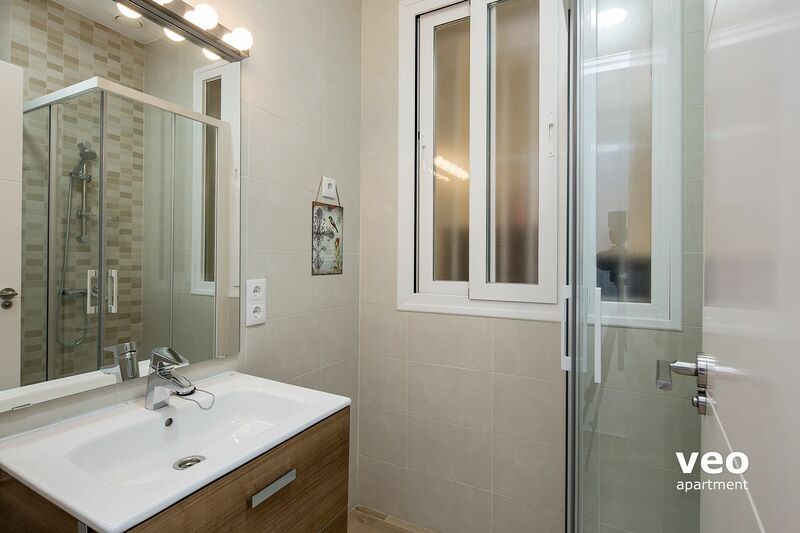 The washing machine is inside the en-suite bathroom. The double bedroom is at the back of the house, and therefore very quiet for sleeping. Bed with 150x190cm. A window faces the interior courtyard of the building. 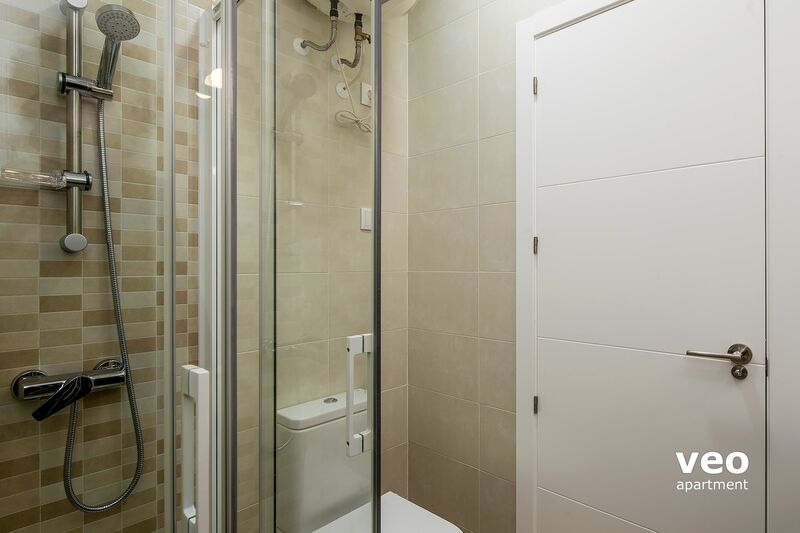 There are 2 bathrooms with shower (1 en-suite bathroom + 1 family bathroom). 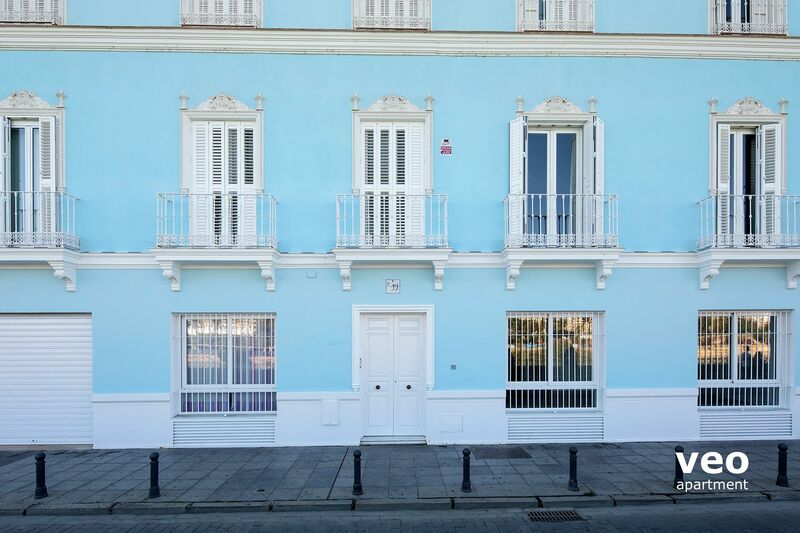 Note: "Betis Blue" is on the ground floor of a recently refurbished building facing calle Betis. This is a lively street very popular for sightseeing, eating and drinking. During the busiest days the living room, which faces the street, can become noisy. However, the bedroom is at the back of the house and very quiet for sleeping. The apartment also has quality windows with double glazed. Daily rate: EUR 15. Reduced price at car park "Mercado de Triana". 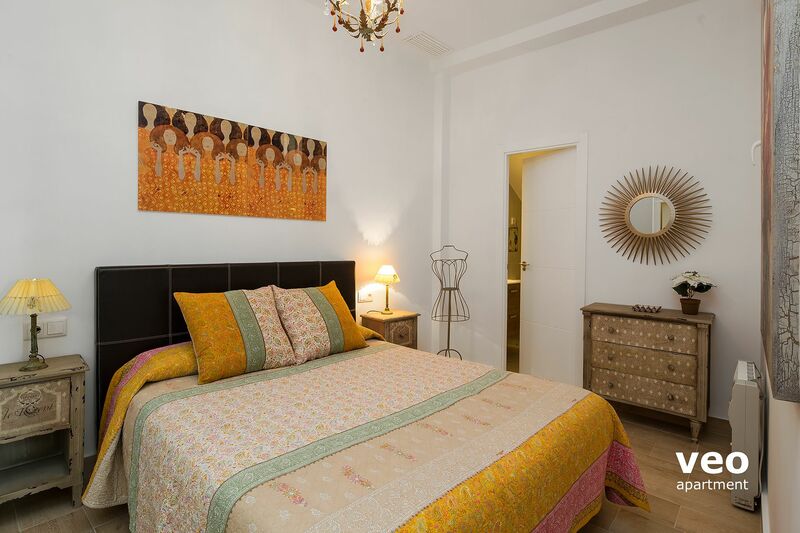 Located at 170 m from the apartment. Reservation by email required. "Great location, clean, all good!" "Not that descriptive, but fine"
Apt. Was great. 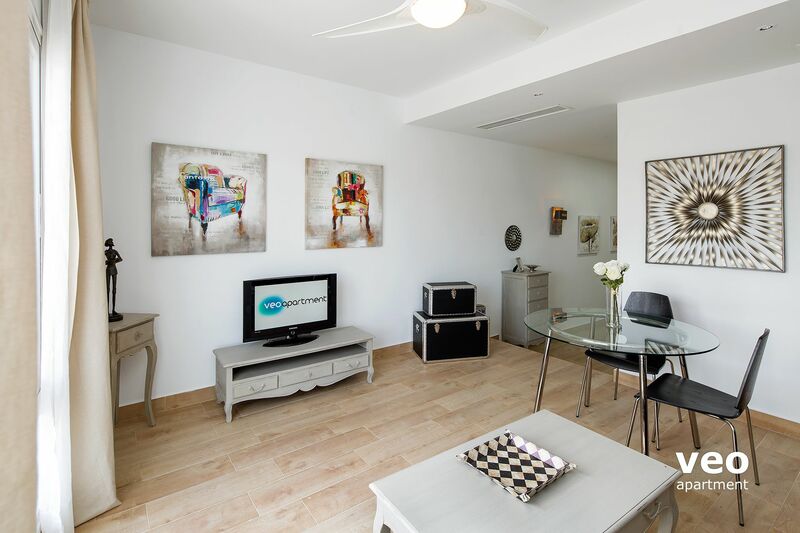 It is a very nice apt well equipped with everything. our only negative was that the internet was only available in the living room. 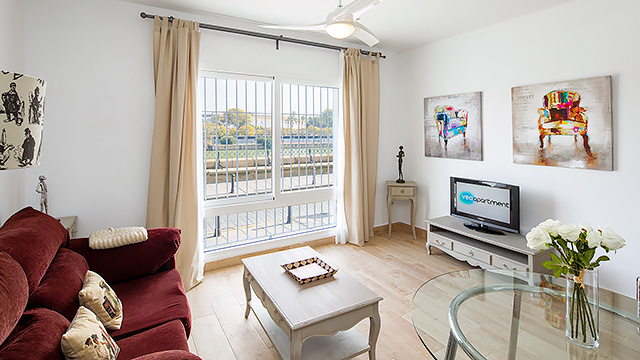 "Petit appartement le long du Guadalquivir"
Petit appartement sympa dans le Triana, situé le long du Guadalquivir. Chouette decoration et accueil sympathique. Dommage pour l'odeur d'egout dans le hall d'entrée. 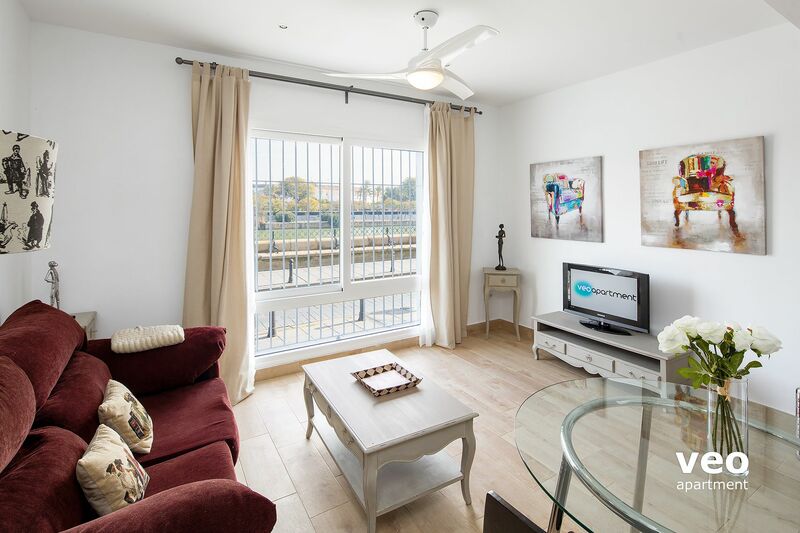 "Nos hemos sentido como en casa"
"Well located, clean and modern"
located very close to the river and 10-15 mins walk to the centre of town. very modern and clean, air-con and heating, etc. I was worried about potential noise from the street, but the bedroom on the back is extremely quiet. 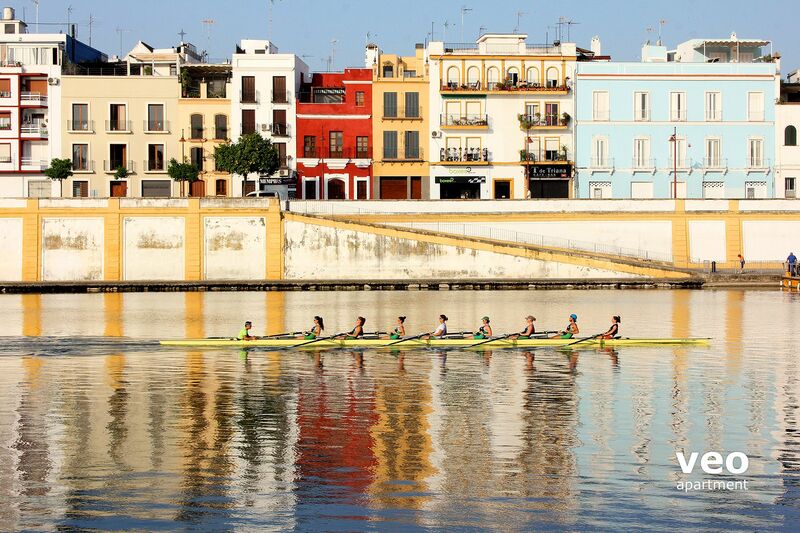 "Bien equipado, limpio, bonito y con unas buenas vistas al Guadalquivir"
Sowohl der Zustand des Apartments als auch die Lage und die Kontaktaufnahme (Buchung, Schlüsselübergabe) waren perfekt. Absolut nichts Negatives zu melden. 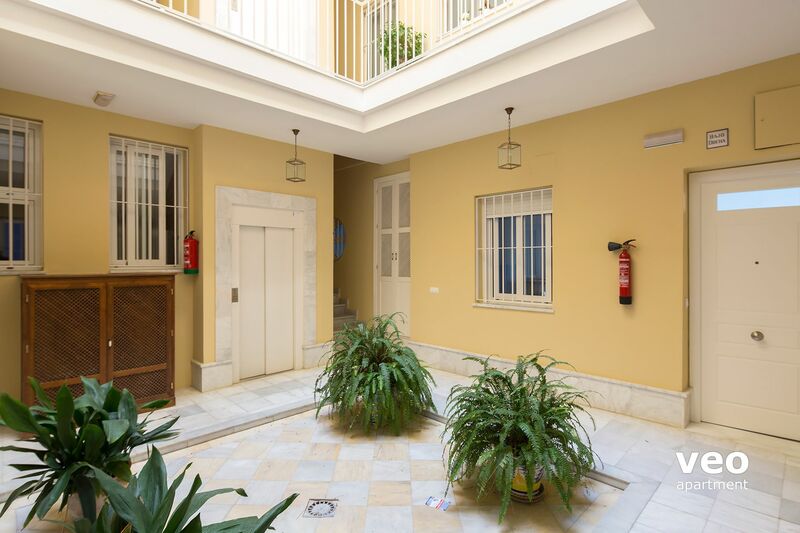 "Excelente ubicacion, comodo y tranquilo"
Bonito y tranquilo apartamento ubicado en la mejor zona de la famosa calle betis con mucho ambiente, todo los muebles nuevos y con calidad y muy buena decoracion, la vista es de maravilla. 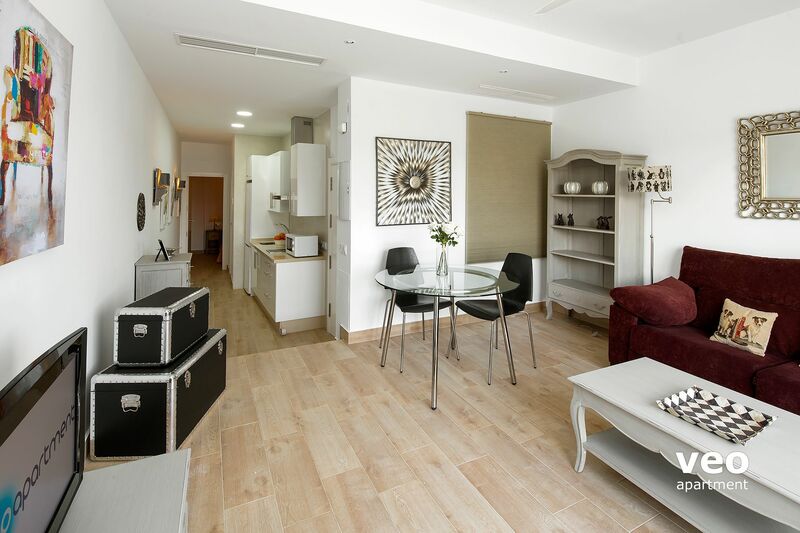 Gracias al Lola y todo el personal de Veoapartment por la informacion y por su amabilidad, volvere seguro. 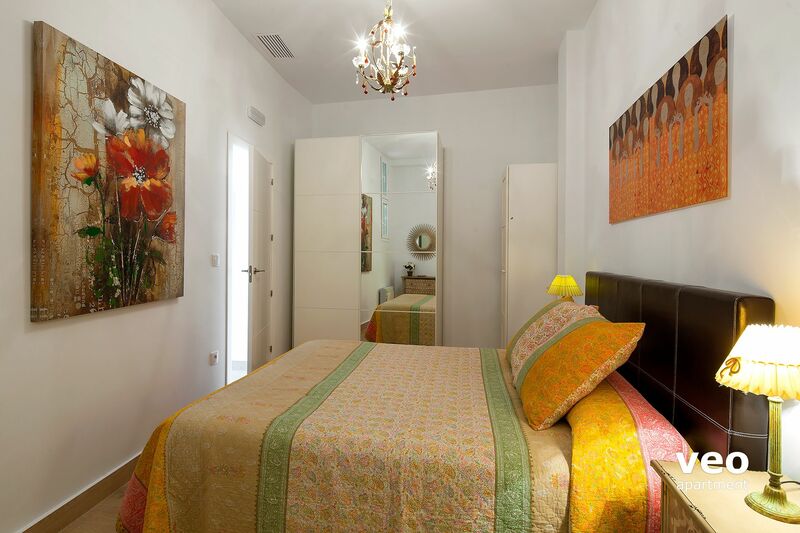 The apartment is very comfortable for two people and the location is excellent. A lot of restaurants, bars and a supermarket near by. 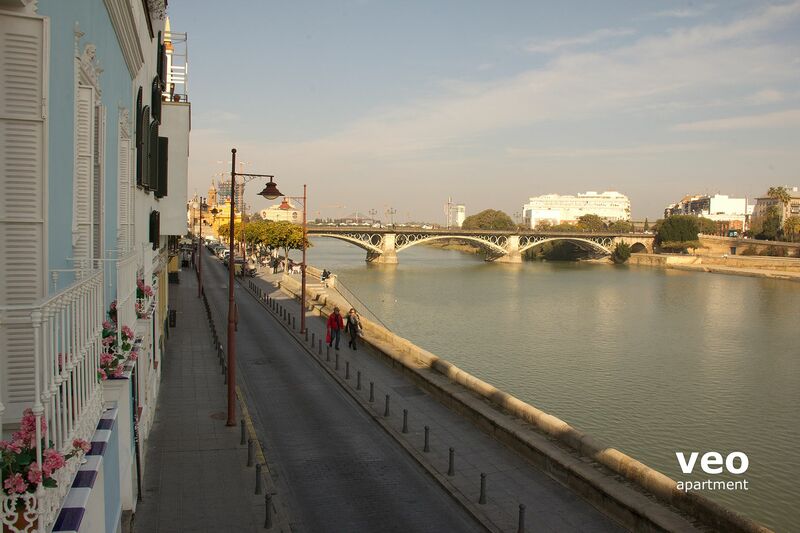 You can easily walk to over the bridge to the churches, museums and shops. 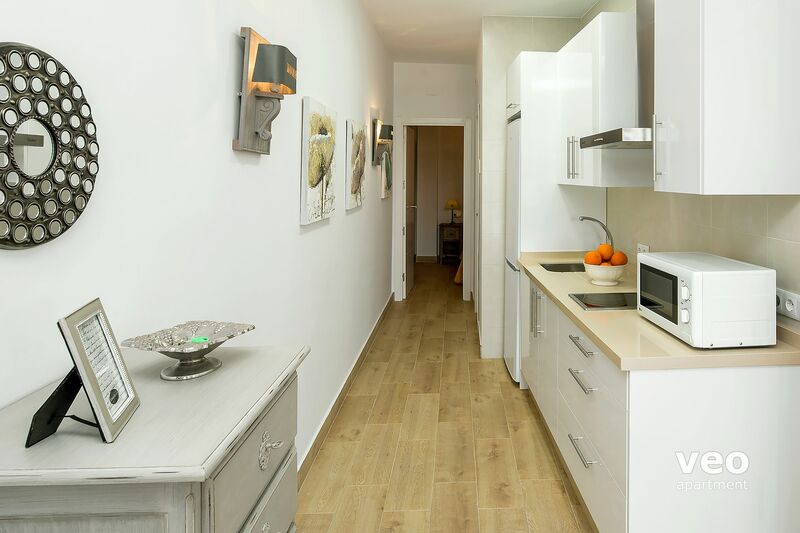 Soy una usuaria habitual de apartamentos cuando voy de visita a Sevilla y tengo mucha experiencia con la calidad de las viviendas de alquiler a corto plazo. 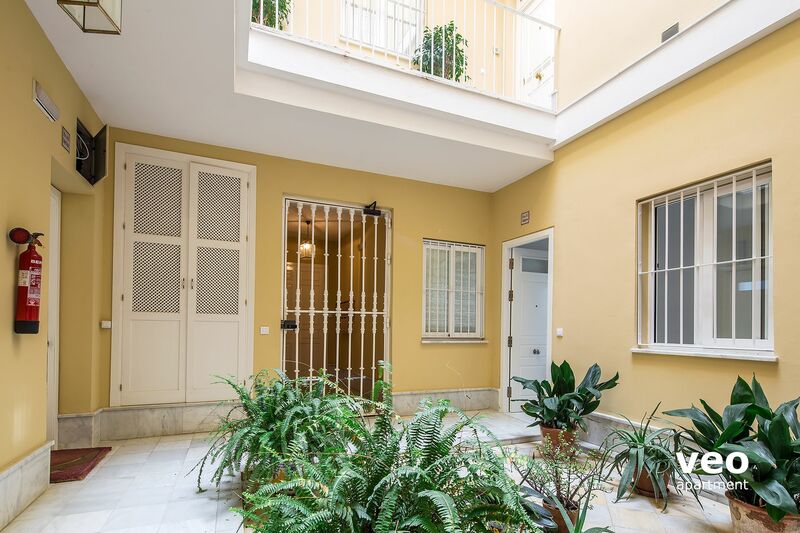 Betis Blue 1 es probablemente el mejor apartmento en el que me he quedado. Me encanto el frescor de la decoración y la amplitud del espacio. La localización es buenísima y he tenido una estancia muy agradable.